You will be given a Free reference e-book to read which has 533 pages And the test will be based on that e-book. What is JAVA 2 Web Development? JAVA 2 web development encompasses the process of creating and building applications, programs and systems for the web with the help of JAVA 2. It should be noted that JAVA 2 is capable of strongly supporting the web development process so it is no longer surprising why it is highly recommended for developers at present. It should be noted that the web applications created using this specific version of JAVA do not typically and directly run on the server. The applications can actually be expected to run within the server’s container. What operates on the server is the container which is also capable of providing adequate and reliable runtime environment designed for all applications based on JAVA. If you have strong intentions of becoming a certified JAVA 2 developer, then it is crucial for you to take and pass the exam which is dedicated to it. You have greater chances of passing the certification exam if you familiarize yourself about the modern servlet web apps’ deployment and structure, the container model of servlet, the process of developing and designing servlets to help them easily manage server-side exceptions, basics of utilizing session management to develop and design servlets and the process of developing and designing the most secure web applications. Fortunately, you have the chance to learn about all these through the free JAVA 2 web developer practice course available at Brainmeasures which also includes a free study guide and practice test. 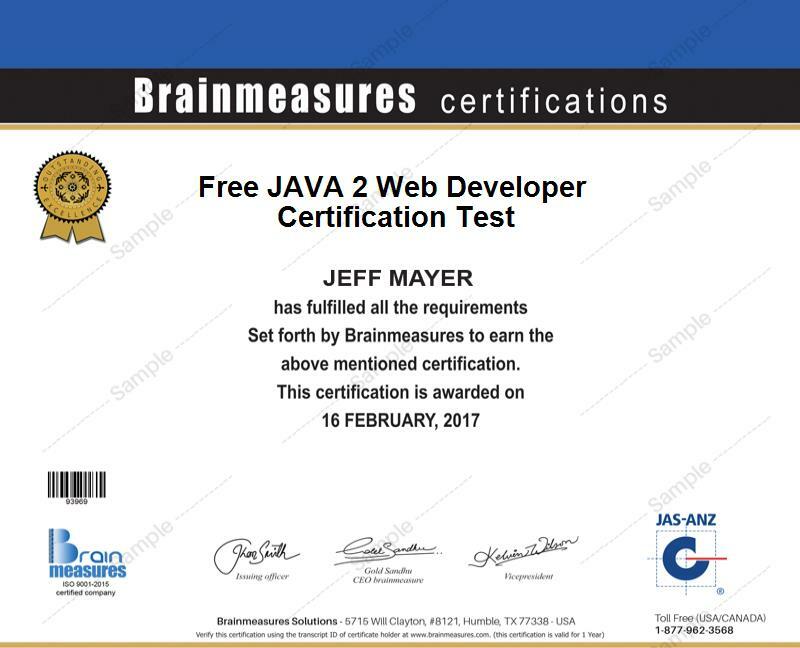 The free JAVA 2 web developer certification practice course available Brainmeasures to the public aims to help anyone who plans to take and pass the JAVA 2 web developer certification exam. Among the many things that you will surely enjoy from enrolling in this free JAVA 2 practice course offered by Brainmeasures is the company’s free study guide which explicitly explains all aspects related to JAVA 2 including its most desirable features, major components, the basics of establishing and developing applications and programs using JAVA 2 and the major roles and responsibilities that you will hold upon becoming a certified JAVA 2 web developer. You will also enjoy the free JAVA 2 practice test provided by this reputable online certification programs and courses provider since it gives you a clearer idea about what it usually takes to confidently answer and pass the certification exam. How to effectively design and develop servlets that are capable of handling server-side exceptions? The free JAVA 2 web developer certification practice course which is now introduced by Brainmeasures to the public aims to guide anyone who wishes to become a certified and knowledgeable expert in the field of JAVA 2 web development. It primarily targets certified web developers, engineers, analysts, consultants, programmers and any other professionals who plan to design and develop the most functional and impressive applications and programs using JAVA 2. A higher level of salary is also provided to JAVA 2 web developer certification exam passers. Holding a recognizable and admirable certificate in the field boosts your chances of working as a JAVA 2 web development manager and earn approximately $89,000 to $117,000 every year. If you grab the position of a JAVA 2 web developer, then you will be on your way towards enjoying up to $132,000 yearly.